Nobody knows how much thought and planning goes into a wedding more than a woman who’s been a part of the process. More details are crammed into a couple hours of a bride and groom’s life than they ever thought possible before she said, "Yes." This dedication and care is not for naught. It is the combination of every aspect of the day that makes a couple’s wedding live in their memory till death do they part. To ensure that lasting quality of your own wedding day for you and your guests, try incorporating one of these three industry trends to make your day fun, fabulous and unforgettable. One of the most cutting-edge wedding trends in the Cincinnati area is brought to you by Steve Zugelter of Studio+Z Films. After working behind the camera writing, directing and producing TV commercials, Zugelter decided to venture into the wedding side of the lens, but he wanted to separate himself from other industry players, he says. After researching film-makers in other markets, Zugelter came up with a same-day edits service. Available as an add-on to any of his film collection offerings, this service shows footage of the wedding-day preparations and ceremony at the reception. "What I want to do is take the guests, take the viewer on a journey of the day because … most of the time they’re never really taken behind the scenes," he says. So Zugelter aims to tell the story of the day, generally including a glimpse of everything that happened before the reception dinner. In addition to his same-day edits, Zugelter sets himself apart with his concept films that make the cameras a more integral part of the wedding. Instead of just filming the action, the cameras become a part of it all. One example of these films is Zugelter’s international-award-winning film named "Daphne + Jason: The Surprise Wedding Concept Film," which is available for viewing on Zugelter’s Web site. The couple showed the film at a reception they had for friends and family before a more intimate destination wedding in Florida. While the film was showing for their guests, the bride and groom slipped into their dress and tux and were ready behind the screen with an officiant to give their guests a surprise wedding, proving the Florida wedding was all a ploy. Zugelter’s camera also has witnessed trash-the-dress sessions, another filming specialty that made him a trend-setter in Cincinnati. During these sessions, brides wear their wedding gowns in places that would usually stop them in their tracks and turn them into bridezillas. One couple, for example, went down to the Taste of Cincinnati to be filmed in a ketchup and mustard fight in their tux and gown. To check out more of Zugelter’s work or to learn more about Studio+Z Films, head to StudioZFilms.com, e-mail studio@studiozfilms.com or call (513) 843-7743. Cakes aren’t the only desserts rising to the wedding occasion these days! From petit-four spreads to cookie tables to candy buffets, today’s bride and groom are looking to leave their guests with a sweet taste in their mouths. 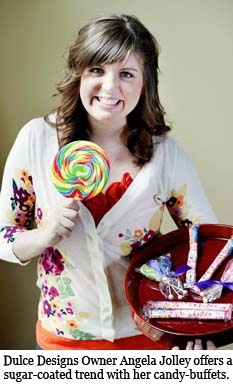 Dulce Designs Owner Angela Jolley gets in on the sugar-coated trend with her candy-buffet possibilities. After using her candy obsession to personalize her own wedding with a sweets buffet, Jolley decided that she wanted to bring her treats expertise to the table for other brides and grooms to enjoy. So she obtained approval by the Secretary of State and received her vendors’ license and started her candy-buffet business in May 2009. Now, she works with brides and grooms to achieve a customized experience that fits the theme and style of both the couples and their weddings. "It’s great to let me do the candy buffets for other brides because I can take their vision and make it happen," Jolley says. Many of her customers opt for a color palette that follows along with the wedding colors, but another common trend has taste trumping looks with a "his and hers" buffet. This option includes the favorite candies of the bride and groom so that guests can get a taste of the couple’s personalities. To get the gumball rolling, Jolley meets with her customer to talk colors, candies and themes. She also offers her various creative ideas to help provide a b etter buffet. After the initial consultation, Jolley researches what might work for the individualized buffet and comes up with a contract within a couple days. Generally, Dulce Designs prices include a $150 deposit. For larger events like weddings, this deposit goes toward the final cost of the buffet. Beyond the deposit, Jolley charges $3.50 per person attending the event. 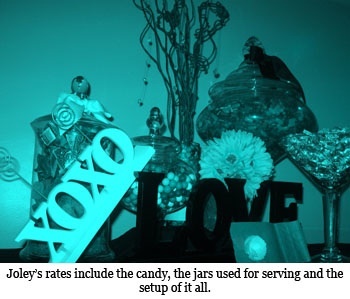 This rate includes the candy, the jars used for serving and the setup of it all. For more information about Dulce Designs, head to DulceDesigns.com, call (513) 305-7275 or e-mail DulceDesignsCandy@gmail.com. Ever heard the expression: "Take a picture. It lasts longer"? Well, the folks at Say Cheese take that to heart and give you and your guests photos to cherish . Say Cheese offers event photo booth rentals so that your reception starts with a flash and entails a whole lotta laughs. "Photo booths just have an uncanny ability to illicit silliness out of even the most introverted people," Say Cheese Marketing Director Patrick Callahan says. The photo booth serves three purposes at your wedding. The booth prints and cuts two identical copies of every set of pictures taken, so besides providing entertainment at your reception, the booth gives your guests a favor to bring home and creates a photo wedding guestbook for you. Each booth comes with an attendant, who is trained to be selective of which photos end up in that guestbook, but included in the Say Cheese packages is a flash drive of all of the night’s photos so that you can make reprints, post them on Facebook or keep them to look at on your 10th anniversary. Say Cheese also offers a magnet option that turns each photo strip into a magnet. This makes the guests’ favor a little more special as they can go home and stick your gift on the fridge to serve as a daily reminder of how much fun they had at your party. Learn more about Say Cheese at SayCheesePhotoBooth.com or call (513) 256-3460.